ADHD : What is "Attention Deficit Hyperactivity Disorder" ? ADHD is a neuro-biological disorder that impacts nearly10% of children and teens today. ADHD is not the result of bad parenting, or too much T.V., or a lack of either discipline or love by parents. While any or all of these may be problems, "Attention Deficit Hyperactivity Disorder" is a genetically based condition.. "ADHD" has neurological and biological roots. There are very strong genetic factors that influence both brain function and development. There are also other potential contributing factors that might cause one to acquire ADHD problems, such as brain injuries received either in utero, or after birth, or high fevers from infections, and so on. Inattention - ADHD causes people to have problems paying attention to routine or boring tasks, or to stay focused on a task long enough to finish the task, especially if the task is not very interesting. The person might be able to focus on interesting projects or entertainment such as video games for long periods of time, but it is the boring tasks of life that are very difficult. Impulsivity - Often ADHD causes a lack of self-control. Impulsive behaviors or choices can cause havoc in relationships, work, school, or life. Saying things, or doing things without thinking first is a pretty classic symptom of Attention Deficit Hyperactivity Disorder in both children and adults. Hyperactivity - About half of those with ADHD are "bouncy" like Tigger, hyperactive, always "on the go," and restless. The standard line is that they act as if they are "driven by a motor." Another good description is "excessive, non-goal directed, motor activity." Easily Bored - Unless the task is very stimulating, like a video game or TV program or outside playing, those with Attention Deficit Hyperactivity Disorder are often easily bored by a task - especially bored by homework, math tests, balancing checkbooks, or doing taxes, and many of these tasks just never get done. Become an even better parent to your ADHD Child or Teenager! 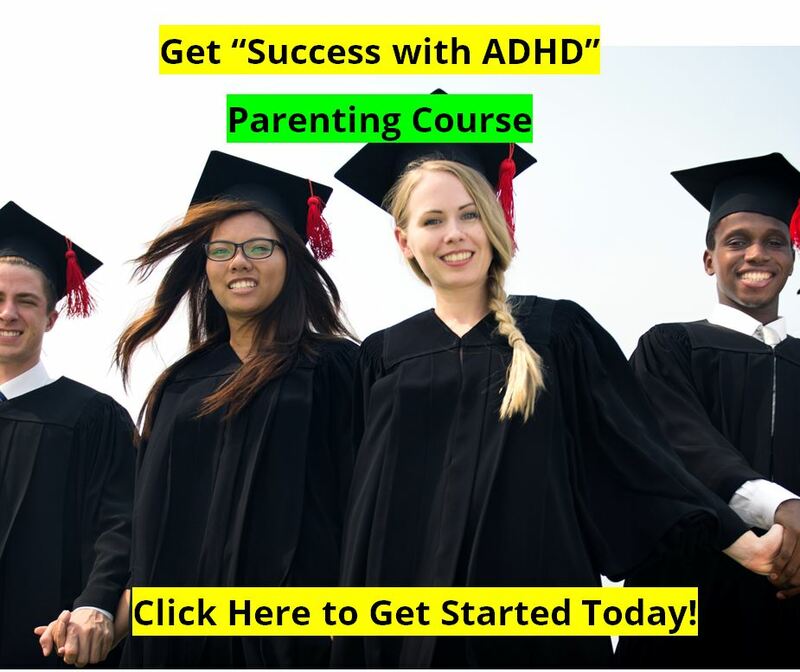 Knowing how important parent training is when raising a child or teenager with ADHD - and also knowing how expensive it can be - we have created our "Success with ADHD" parent training course for you! It's like Continuing Education for parents! This is an online video course of 17 Videos, each about 15-20 minutes long - just right for the busy life we all seem to have. Plus we have included 3 bonus ebooks, including our ADHD Eating Program, and 101 Classroom Interventions. 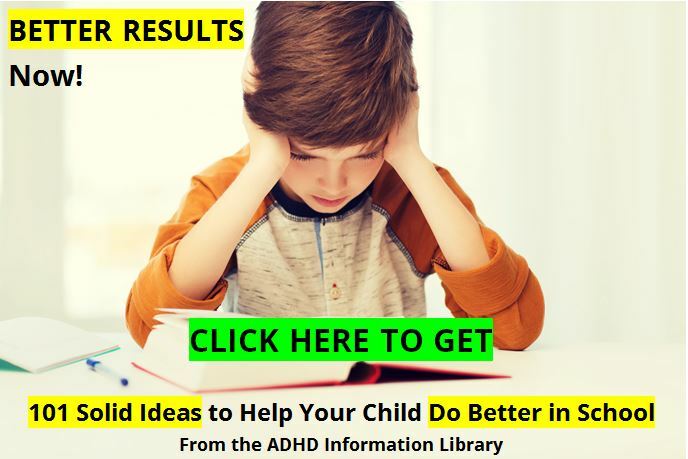 You Will Get Even Better at Parenting Your ADHD Child or Teenager to Success! Learn How to Keep Your Brain Healthy for a LifeTime, and make it Work Better Now - for you and your children! This may be the most important information of all! Parenting Tips for Everyday Life - so we can get even better and better at raising the next generation who can change the world! This parent training course has months of material - to change your family and your child's future! We are offering a Very Special introductory rate for the course of just $27.00. ADHD is the short abbreviation for "Attention Deficit Hyperactivity Disorder", which is one of the most common childhood behavior disorders. It is estimated that somewhere between 9% and 12% of all children have this neuro-biological condition. Of all children referred to mental health professionals, more are referred for ADHD than for any other condition. But Attention Deficit Hyperactivity Disorder is also one of the most treatable of all psychiatric disorders, with several effective options ranging from medications to alternative therapies, psycho-social treatments, and educational interventions. Those with ADHD can have problems in many of the areas of their life, including home, school, work, and in relationships. Attention Deficit Hyperactivity Disorder is a chronic and unrelenting problem. Though it will change in form through the years, it will persist into adulthood and impact all relationships including marriages, parenting, and work performance. "ADD ADHD" is a neurologically based disorder. Some would like to dismiss the diagnosis of Attention Deficit Hyperactivity Disorder altogether saying that there is no evidence of neurological differences, or that there are no medical tests to diagnose ADD ADHD, or that the diagnostic criteria is too broad. But they would be wrong. There is an overwhelming amount of research to support the statement that, indeed, Attention Deficit Hyperactivity Disorder is a neuro-biological condition. We discuss this in great detail in the neurology of the ADHD brain and offer plenty of ADHD research information. 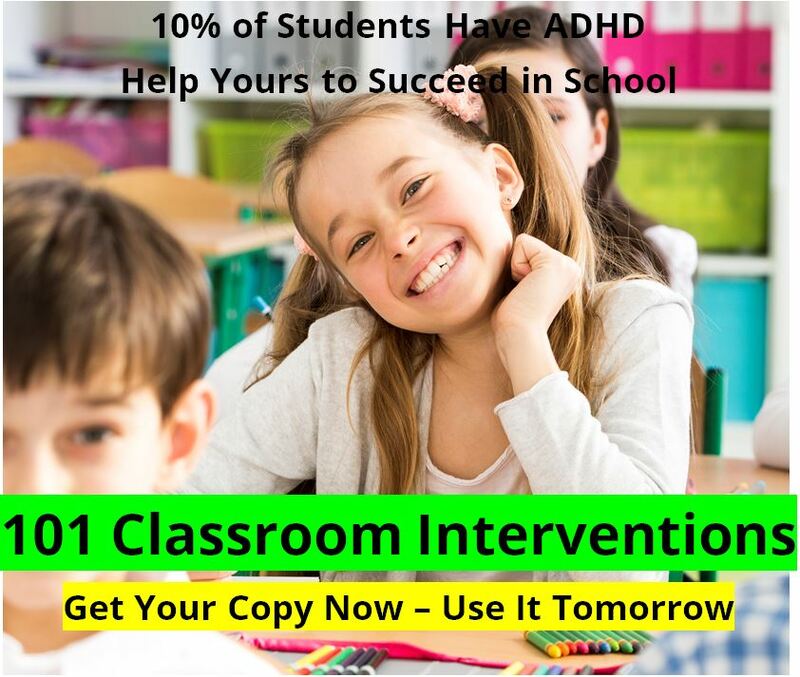 101 Classroom Interventions : An ebook from the ADHD Information Library! Over the past 30 years here at the ADHD Information Library, we have talked with hundreds of classroom teachers, school psychologists, and administrators to find the best ways to help children and teenagers with ADHD to succeed in school, and we came up with over 500 quality classroom interventions, tips, tricks, hacks, or good ideas for both teachers in the classroom and parents at home. And that is a lot of information to look through! We just posted this article at http://DouglasCowan.me for our counseling clients, but wanted to make it available to you as well. It is also now included in our ADHD Diet Program for 2016 that we will post online in October, 2015 at http://ADHDdiet.info.